Golf swing rotation is commonly perceived as the upper body rotating about an inclined axis of rotation passing through the lower back and out through the top of the head and at a right angle to the swing plane (wagon wheel image of a central hub with the arms and club as the spokes). This is a false perception. It is difficult to coordinate the inclined rotation of the upper body consistently with the naturally upright rotation of the lower body and to turn the shoulders fully in each direction. Also without direct ground reference the inclined axis is dynamically unstable and power to the shoulders from ground traction is limited. 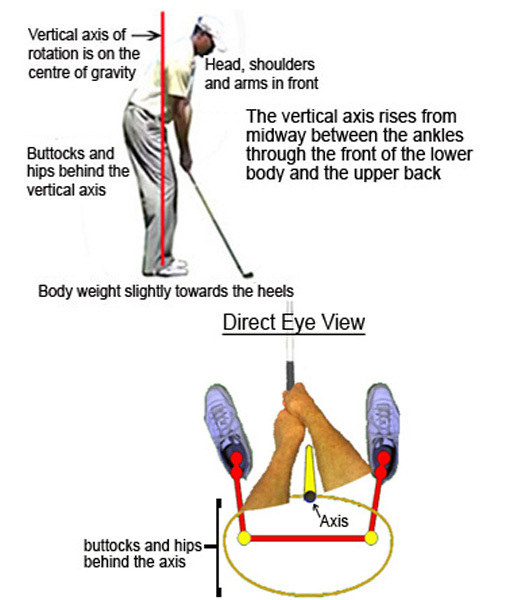 A vertical axis rising from midway between the ankles and corresponding to the body’s centre of gravity is stabilised by direct “tie down” to the ground so that the golf swing power is generated directly from the ground up through the feet and legs. 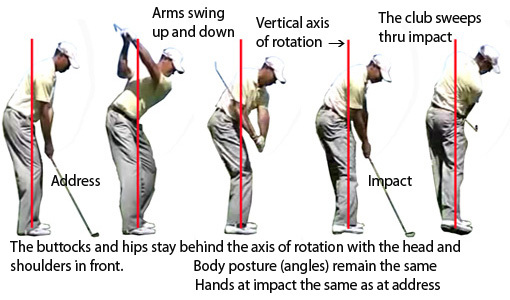 Because proper golf swing rotation is central to overall swing technique it is important to understand the way in which other dynamic effects must be controlled in order to maintain a stable axis of rotation. Body weight shift is essential for stability of rotation by bracing against the effects of centrifugal force and the swing power forces generated through the feet and legs from ground traction. Retention of wrist cocking against the unwinding effects of centrifugal force, in the downswing (lag) is essential to ensure “on plane” club head acceleration while maintaining rotation stability. Having the hands ahead of the club head with a flat or forwardly bowed leading wrist at impact is a much touted requirement in general golf swing instruction based on observations from snapshots of elite golfers. However, as explained from the "Flat left wrist" link below, that circumstance is involuntary due to dynamic effect rather than intentional.